FORT MILL, S.C. – Feb 11, 2019 – Dynapac North America introduces the MF2500CS feeder to the North American product portfolio featuring two new models, the MF2500CS and the MF2500CS with SwingApp. These innovative feeders offer unmatched production capabilities and lowest total cost of ownership, boasting a capacity of up to 4,000 tons per hour. The units are also extremely versatile and able to handle a variety of material applications, including asphalt, stone, RCC and Road base material. In terms of productivity, the Dynapac MF2500CS feeder features a high performance and durable conveyor belt system that can empty a standard 35-ton truckload in as little as 35 seconds, significantly reducing truck cycle times and boosting overall productivity. With a feeder width of 8 feet, 4 inches (2.55 m), the Dynapac MF2500CS is simple and cost-effective to transport, adhering to standard North American transportation requirements. This model feature a maximum transport mass of 22 tons (20 metric tons). The MF2500CS is also available with SwingApp functionality, which can transform the unit to an offset feeder by swinging the conveyor belt up to 55 degrees in either direction. This allows for optimal versatility of the MF2500CS, with the capability to handle a variety of feeding applications, including feeding two pavers in a side-by-side configuration, feeding one paver from a different lane or filling medians. SwingApp can be mounted on any Dynapac MF2500CS unit, providing optimum fleet management flexibility. The SwingApp can be mounted in less than two hours. Total cost of ownership is one of the most important benefits of the new MF2500CS. There are a number of contributing factors that help the Dynapac feeder achieve lowest total cost of ownership, including well-engineered conveyor belt design, to reduce wear to the components, and simple transportation of the feeder due to its compact transport dimensions. In regards to durability, the new MF2500CS is engineered with unique well supported belt conveyor system, extra heavy duty track design increases the wear life and reducing the need of costly annual rebuilds associated with traditional MTV’s. Additionally, averaging less than two and half gallons per hour of fuel consumption will reduce the operating cost significantly. Dynapac takes the operator experience to a different level by addressing comfort and confidence during the paving process. For example, Dynapac’s Clearview platform can raise the operator station three feet with the touch of a button, allowing excellent visibility of the job site. The operator platform on each side of the feeder also allows for swing-out functionality and can pivot 90 degrees for maximum visibility regardless of the specific complexities of the job site. Additionally, the controls of the MF2500 feeders are intuitive and simple to use, allowing operators of varying skill levels to confidently operate the feeder. The Dynapac feeder is fully-automated through the integration of auto distance control and auto feed to the paver. The multifunction joystick integrates main drive and SwingApp functions to put full control at the operator’s fingertips. The large LCD monitor delivers all necessary procedural and diagnostic information along with camera feeds including the material level on the paver hopper in an easy-to-use interface. The Dynapac Truck assist system improves seamless communication between the feeder operator and truck drivers. The Truck assist system is easy to implement, noise friendly and eliminates the need of dump personnel to improve job site safety. At the end of the paving day there are fewer components to clean on the feeder as the conveyor belt is cleaned throughout the day with Auto Belt Clean feature. This increases the time available for paving boasting additional productivity gains. The lower ground pressure is achieved thru the track design, allowing the contractor to pave on bridges and easily park on soft surfaces. The MF2500CS models are powered primarily by a Cummins® QSB 6.7- C225 diesel engine and can reach operating speeds of over 80 feet (25 m) per minute, and a transport speed of 2.5 mph (4 km/h). For more information on Dynapac products, please visit www.dynapac.us. 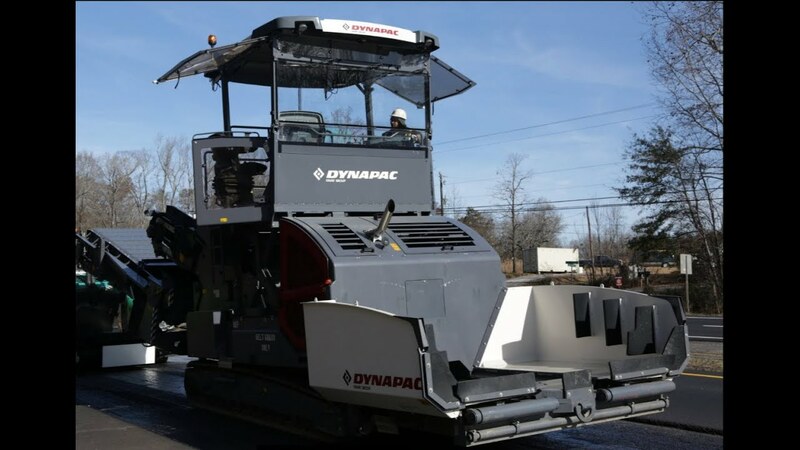 Dynapac is a leading supplier of high-tech soil and asphalt rollers, pavers and milling equipment, committed to strengthening customer performance. Dynapac is represented worldwide via its own regional sales and service offices, and also cooperates with an extensive professional distribution network. Headquartered in Wardenburg, Germany, Dynapac has production facilities in Europe, South America, and Asia. Dynapac is part of the FAYAT Group. Dynapac North America customer support and distribution is located in Fort Mill, SC. www.dynapac.us.